From our August 2017 issue. Some of the best recipes happen serendipitously, lovely discoveries that inspire the culinary mind and please the palate. This late-summer assembly of grilled vegetables on sourdough toasts, laden with a sauce of heirloom tomatoes, chopped basil, and parsley, is the result of an abundance of garden goodies and a need to put herbs to good use before they flower and become bitter under the hot August sun. The charred edges of the toasts, eggplant, and zucchini add rustic tones to the soft, sweet, and smooth broken-down tomatoes. In a large saucepan, warm 2 tablespoons of olive oil. Add onion and sauté over medium-low heat until it becomes translucent. Then add garlic and cook until the aromatics begin to turn golden, about 15 minutes. Add tomatoes and cook until they break down and slightly reduce, another 10–15 minutes. Season to taste with salt, pepper, and red pepper flakes. Chiffonade the basil and rough-cut the parsley. Add them to the sauce right before you are ready to serve. Turn on the grill to medium heat. 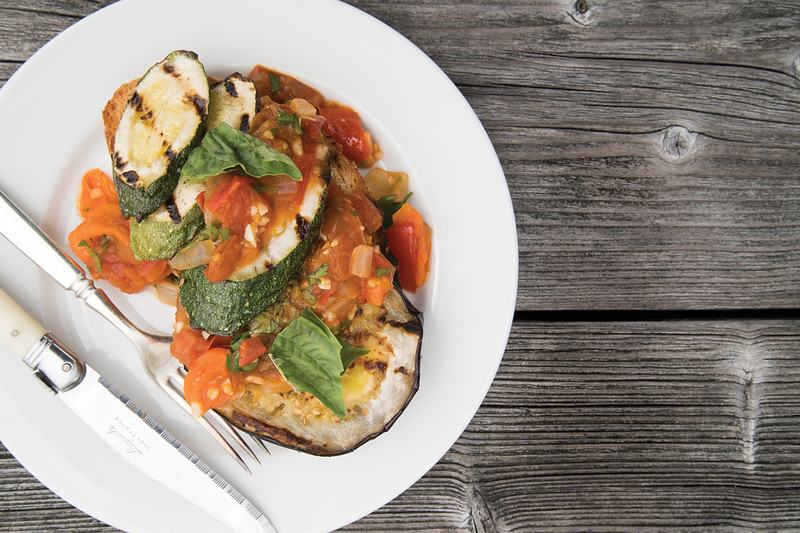 Toss the eggplant and zucchini in salt and olive oil. Grill the eggplant and zucchini until they’re tender and have acquired grill marks. Grill the bread on both sides until just charred. Place the bread on a large platter. Lay a couple slices each of eggplant and zucchini on the toasts. Generously ladle spoonsful of sauce over the top of each vegetable toast. Garnish with additional basil leaves, good olive oil, and sea salt.